I must have to admit that the concept of glass straws seemed mind-blowing. When I think of drinking straws, automatically what comes to mind are the plastic straws we commonly use and see in stores and restaurants. So when I heard about Glass Dharma, the maker of the original glass straw, I was intrigued to say the least. I was given the opportunity to try Glass Dharma's four (4) different kinds of glass straws for the first time and this I'll say in all honesty, I'm never gonna go back to using plastic straws again. Here's why. They are reusable, so one glass straw replaces thousands of plastic straws, which will help you eliminate yet another wasteful plastic disposable. Drinking out of a glass straw gives you a feeling of class, beauty and elegance. You’ll feel like royalty – with a touch of ‘glass’. Dharma glass straws are sustainable, durable, easy to clean, suitable for hot and cold beverages and dishwasher safe. Not only do they promote health and are environment-friendly, but they look so stunning as well. The wonderful people behind Glass Dharma sent me a set of 4 elegant drinking straws. It comes with cleaning brushes in each of the two sizes, as pictured below. My favorite is the one with the beautiful bend and the decorative dots. Whether you're drinking your favorite juice or enjoying your healthy smoothie, you can be assured that you're doing it with style and of course contributing something to Mother nature. Thanks to the ingenuity of Glass Dharma. Of course, my review wouldn't be complete if I won't let my curious little monkey try it as well. So I had him drink his OJ in his favorite tumbler but I removed the plastic straw and replaced it with the glass one. Actually, my only fear about using a glass straw is whether it's safe for my 2.5 kiddo to drink from. Well, the following information is very important to know. The workmanship being put into these glass straws are at par excellence with the world-famous Corning, Inc (the makers of Pyrex). They adhere to a formula for annealing their glass art (a process that strengthens the glass) with specifications and guidelines provided by Corning, Inc. They are exclusively made of borosilicate tubing, exactly the same type of glass that our durable coffeepot or pie plate was made of. So it's fairly safe to say that these products are extremely durable and virtually unbreakable. As a matter of fact, their products are covered with the unbelievable Lifetime Guarantee Against Breakage. Although as a mom, I wouldn't recommend using these for toddlers unsupervised. But if you have older kids (5 and up), they work great. My little guy only used this once and I was just right there with him all throughout the drinking process. Another great thing about this product which I think is worth mentioning is that they are Handmade in the USA. You cannot say that with most of the products that we have been using. Thank you for making it this far in my review. The generous Glass Dharma people would want to make one lucky My Sweet Haven reader happy by offering a $25 Gift Certificate to www.GlassDharma.com. Giveaway begins May 18, 2013 and ends 11:59 AM on May 28, 2010. Winner will be notified via email. This contest is open to US residents only. Winner should follow the mandatory requirements through Rafflecopter below, otherwise another winner will be drawn. Prize will be transferred via sponsor. Goodluck everyone! Entered the giveaway :-) I like the one with decorative dots. It looks fun! I like the beautiful bends! I use straw everyday for my smoothies and now I am wanting this kind. Sounds really a great product to try. I think I will like this as well! My kids love these too! We never had any of these before so they find it fun to use everyday! Good luck to all who joined. The designs are fun. I like them all but most of all the beautiful bends! how interesting right?! I'm so amazed with these glass straws....very innovative! My family loves using their glass straw because of the elegant look and avoid the usage of plastic straws. I wondered about breakage of these straws--they are made well! The absolute last thing anyone needs is to have a piece of glass break in their mouths! Love the idea of these for a grown-up party with cocktails. I love these straws! 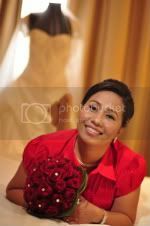 I think they add a really nice touch for parties and are also Eco friendly. These are neat, I like that they have the little cleaning brushes its so hard to keep and reuse disposable straws! I love our glass straws from Glass Dharma too, ate Jhen. Perfect for traveling as well when kids need some straw. :) They are thick and durable though. Thank you, I have been waiting for this giveaway so I could try them. Hope I win. I love these straws. My favorite one is the bent one. Terrific straws. The glass ones that bend would be great@!! Love these for my kids since they love drinking with straws. Hopefully they don't break easily! Never heard of glass straws before. But,I'm willing to switch from plastic to glass straws for my family's safety! when you sip it, do you feel that it's a glass? 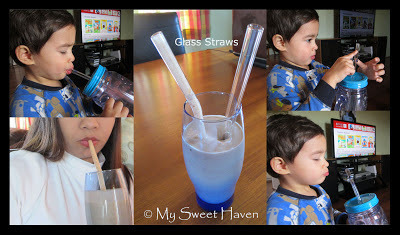 i was thinking that kids can bite straws when drinking and I'm kinda worried if they are really strong glass or not..
entered on your giveaway! thanks! This is an interesting concept and with the use of we'll be sure to use less plastic straws. But it looks too tedious to use and clean everyday. Aren't they easy to break? I am planning to make some smoothie today for the kids to use the straw again, they keep bugging me wahhh.. I would prefer the straight one. Doesn't really matter to me, I don't usually use a straw, but my son does. He loves to chew on his straw and I think this might be the best one for him. It's my first time to see glass straws and I find them cute!! New follower from Fun Friday Blog Hop! What a cute blog! Newest follower here... I was kinda hopin' you'd pop by my blog and follow me back!